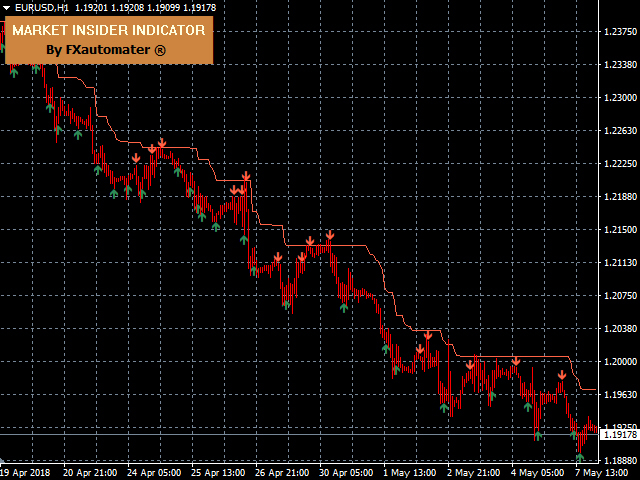 Market Insider is an excellent indicator for scalping the trend and also trading market breakouts and reversals. It is based on a ATR measured volatility channel and the CCI indicator. The green trend line and green bars indicates an uptrend and the red trend line and red bars indicates a downtrend. An intensive price breakout of some of the trend lines indicates a market breakout and a potential new opposite trend. In choppy-range behaving market and in low liquidity conditions the breakout signals can be an indication for an opposite signal. The CCI indicator initiated arrows are signs for overbought and oversold market in the context of the current trend and can be used for entry and exit scalping signals. 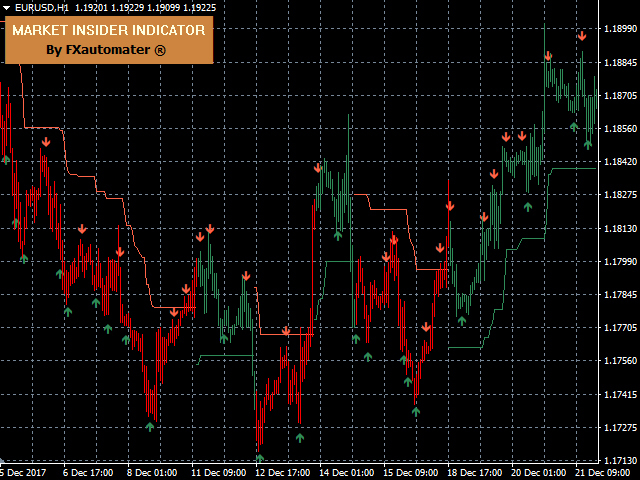 For best performance the indicator must be visually adapted to the used timeframe and trading instrument. The trend lines can be successfully used as an initial SL levels and following trailing stop levels. Market Insider indicator can send push notifications to mobile phones. ATR_Period – the period of the ATR indicator used for calculating the trend lines. ATR_Factor – the multiplying factor which determines the distance between the market price and the trend line. CCI_Period – the period of the CCI indicator used for calculating the overbought and the oversold entry and exit levels. CCI_Level – the CCI indicator value which determines the overbought and the oversold entry and exit levels. AlertSystem – switches on and off the signal alerts. AlertPasuse – pause between the alerts in seconds. Send_Push_Notifications - activate/deactivate sending notification to mobile phones. bars – number of chart bars for which the indicator will be calculated and displayed on the chart. Click here to check my other products! If you like my product, please write a review! I will be very grateful! If you want to be notified of my new products, please add me as a friend! Не разделяю восхищений. Оценка три мало четыре звезды много. Another great product from the author. Thank you Lachezar! Лучший индикатор из всех платных и бесплатных которые у меня есть!!! Спасибо автору за этот продукт!!! 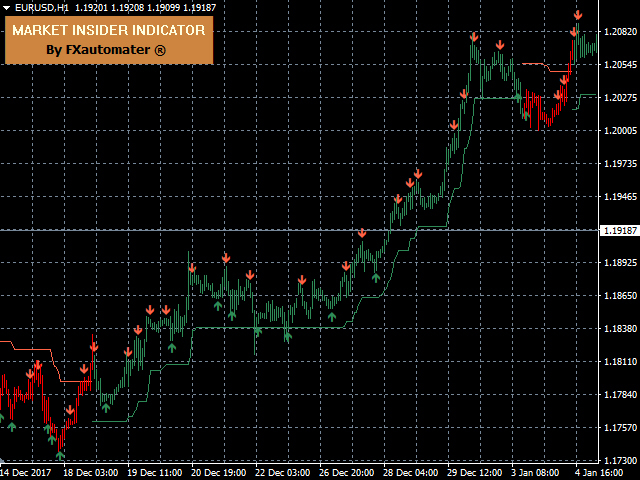 A small bug is fixed in this new version 1.2 of Market Insider Indicator. There is a new parameter called Send_Push_Notifications. When enabled Market Insider indicator will send Push Notifications to mobile devices of the users. By default the new parameter is disabled. You have to set it TRUE in order to use the new functionality.